Buckingham Fountain, one of the largest in the world, was built in the early 1900s and was inspired by the fountains of Versailles. The fountain is said to represent Lake Michigan itself and the states that surround it. Every hour the fountain wakes up and dances to lights and music for about 20 minutes. You can find out more about the schedule here. The fountain was named after Clarence F Buckingham who was a successful Chicago businessman that was involved with “the Corn Exchange National Bank and the Illinois Trust and Savings Company. He also served as president of the Northwestern Elevated Railroad Company, and was involved in insurance, steel and real estate.” –source. He was also very involved with art and help build public art collections for Chicago’s museums (assisted by Frank Lloyd Wright and others). You can read more about Buckingham here. 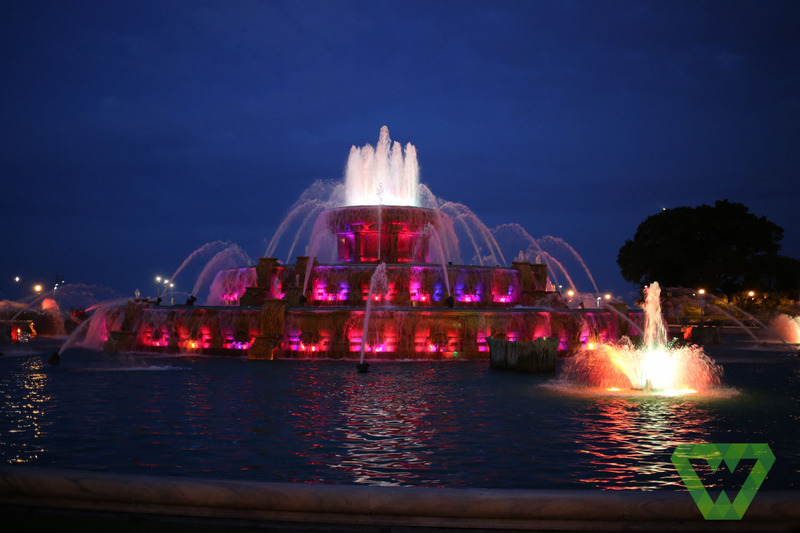 Buckingham Fountain is located in what we like to call Chicago’s “Central Park”. Read more about it in our adventure about Chicago’s Cloud Gate here.